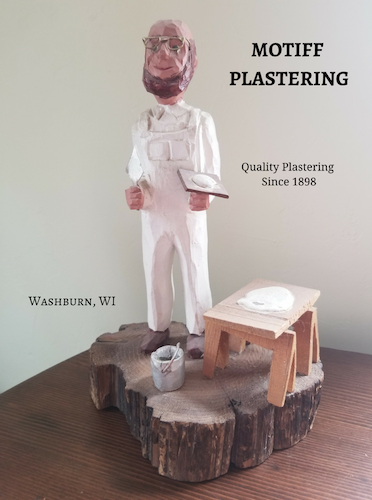 Motiff Plastering is the Washburn Area Chamber of Commerce Member of the week. The Motiff family has owned the plastering business since 1898. Victor Motiff started Motiff Plastering in Belgium and brought his trade with him through Ellis Island and eventually he took up shop in Green Bay, WI. Mitch is the 3rd generation to run the business and has over 20 years of experience. He started working in the family business when he was just 14 years old. He took over when his father Tom retired in 1998. After retiring Tom and his wife moved to Bayfield and shortly after Mitch and his family moved to the Chequamegon Bay area as well. Beautiful walls & ceilings are what they are known for. Just take a look at Patsy’s or Good Thyme the next time you’re there to see an example of their work. Plastering is a great option for new construction especially if you want to add some character. It’s also great for remodeling projects where you are trying to match an existing texture. To learn more about Motiff Plastering and why they prefer plastering over drywall head over to their website. While there you can also find information on how to request a free estimate.